Talk title: Seasonal produce - what's in season, foraging tips and how to grow your own. 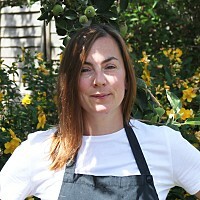 Gemma Taylor Bradshaw is chef and owner of Well Seasoned Kitchen who create delicious seasonal food from the finest home grown and locally sourced produce. A regular at Ripley Farmers Market in Surrey, her cooking can also be found in farm shops, pop ups and private events across the South East. Following her passion for the outdoors and travel Gemma worked as a chef in the Alps for many years before returning to the UK in 2008. Since then she has enjoyed working with several leading catering companies in events, education and inflight catering including most recently for Absolute Taste. A love of working with quality seasonal ingredients has led her to become a keen allotment holder, an enthusiastic forager and champion of locally sourced food.